← Democrats really DO want to take away your guns! But I will predict that nothing will come of the ‘investigation’. Why? Because David Gregory is one of the ‘elites’ who cannot possibly commit a crime because their only intent is to serve the greater good of the progressive agenda. Take the case of Lt. Augustine Kim. After being injured on foreign soil while defending his nation’s freedom, Lt. Kim returned home to find that, in DC at least, there is very little of it left to defend. Lt. Kim was transporting his legally owned firearms from his parent’s home in New Jersey to South Carolina when he stopped at Walter Reed Army Hospital in DC for an appointment. Bad move! After getting lost and pulled over by police, he was arrested, thrown in jail, and had over $10,000 in guns seized by the District. Despite the fact that he had no evil intent, Lt. Kim didn’t get a pass … but I bet Gregory will. Or how about the case of Army Specialist Adam Meckler? Meckler, who had recently ended his active duty tour, was dropping off records at the VFW in DC when they discovered a few rounds of ammunition in his bag left over from recreational shooting. Let me repeat that … a few rounds of ammo … not a gun … not a knife … not an RPG … a few rounds of 9mm ammo. For that ‘crime’ Specialist Meckler was handcuffed, treated like a terrorist, arrested, and forced to accept a plea deal that will mark the honored veteran for the rest of his life. But will the same happen to Gregory? I don’t think so. So let’s recap. Two soldiers, absent any evil intent, violate the strict letter of DC’s draconian gun control laws and end up getting no leniency from a justice system that serves anything but true justice. However, David Gregory is told that he would be violating a law, continues to do so in front of thousands of witnesses, is on tape committing the crime, and will almost certainly not be charged. Remember that when next you hear an anti-gunner talk about gun control. They don’t mean that the laws should apply to them. Equal protection of the laws means nothing when progressive elitists are those violating the law. If those pushing gun control on normal Americans want to preserve any semblance of moral authority, they will rise up and call for Gregory’s immediate arrest and prosecution. If they do not, then it is prima facie proof that they are not in favor of gun laws but are simply anti-civil-rights. The elite (friends of the powers that be) get a free pass, while the average citizen with no malintent, gets the shaft……….w/o a kiss. Equality before the law is being perverted. Didn’t you know? Laws are only for us peasants. The elite, and anyone who has curried their favor by being useful in promoting their ideals, are naturally exempted from such measures to keep the peasantry obedient. 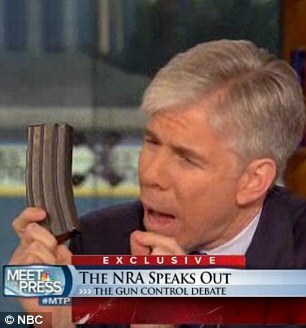 If David Gregory was Glenn Beck, the folks who run this blog would be proclaiming him a national hero. But since Gregory was speaking-out against gun owners who are so insecure they need huge clips that carry massive numbers of bullets simply to feel secure (try Depends–a cheaper solution), the pro-gun forces are all demanding that Gregory be arrested. It would be quite interesting indeed to know exactly how many gun fanatics in Washington D. C. are illegal owners of the same clips. Weaponry isn’t about self-protection, it’s about social power. The more some people with really oversized egos feel that the world is outside their control, the more those people will gun-up. Perhaps they should go to the doctor to see how to reduce their out-of-control testosterone levels. Clearly, Gordon Hilgers has some issues with his own masculinity (or lack thereof). Just look him up on YouTube and see the special kind of idiot we’re dealing with here. My biggest issue with progressives is that there is no concept of principle and right /wrong — it’s all relative. Was he doing it for a noble (by a progressive’s definition) reason? Then, no problem because the end justifies the means. If Glenn Beck had done the same thing, I might be talking about how awesome he was, but I’d also be talking about how he broke the law and if he was arrested for it, I’d definitely think he earned his incarceration.